Heading out on the open road with your family is a great way to make lasting memories and get that quality family time that is often so hard to come by these days. RV travel goes hand in hand with physical activity and trying new things; however, with smartphones, tablets, iPods and handheld gaming consoles, it is now far more difficult to tear your kids away from their digital toys and encourage participation in activities that are good for physical health, expanding their mind, promoting spiritual growth or helping the family grow closer. The best way to get kids of all ages to actively participate in family vacations and engage in healthy activities while on the road is to provide plenty of options and opportunities. If you come prepared with a list of ideas that includes an array of possibilities, there are sure to be at least a few that your children and teenagers will find appealing. When creating your list, keep in mind that it is not just physical health you will want to encourage while on the road; make sure you include options that promote good mental, emotional and spiritual health as well. While on the topic of emotional health, you will want to keep in mind that miserable kids can make for a miserable family trip. Therefore, if you have a son who is addicted to Facebook or a daughter who can’t put down her handheld gaming console, you will want to make time for these things in your trip itinerary. Your kids might also be missing friends back home and wanting to stay in touch via text or through a social media site. Setting aside time each day, or every other day, to allow your kids to have some alone time on their electronics to enjoy a video game, post a picture from the trip online or text with friends on their smartphones is a good way to maintain balance and keep everyone happy – and can also be used as a bargaining chip when trying to convince them to take part in other activities. 1. 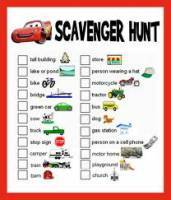 Organize a nature-based scavenger hunt. 2. Plan family hikes or morning walks. 3. 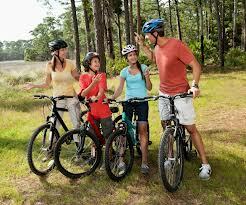 Bring or rent bikes for family bike rides. 4. Visit historical and cultural sites that provide educational opportunities and the chance to be physically active while exploring the area. 5. Treat the road like an outdoor classroom where you can teach your children things they will not learn at school. 6. Make a family Facebook, and put your Facebook addict in charge of posting to it throughout the trip. Include some physical activity by getting out in nature to get some great photos to post. Taking children and teenagers on the road is a fantastic way to make family memories and provide them with opportunities to experience and learn about new things. It may take a little extra effort to convince them to stay physically active and engaged with other family members, but the memories you make and benefits they will receive make it well worth it!